No problem for you, a powerful wizard, accomplished in the arts of magic and dragon lore. The High Council has chosen you among others to breach the spells guarding the island, explore its dangers, then return in fame and glory with the fabled treasures. Cast your magic to capture dragons and gain their power to help your quest. Whomever returns with the most treasure will be granted land, wealth, and titles befitting a king. You must be clever, resourceful, and brave to succeed in this quest. 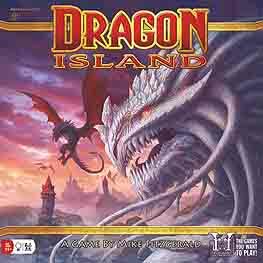 The time has come to finally conquer DRAGON ISLAND!